If we are to get technical here I have actually been to another one which took a conference-like approach (minus the posters). The volcanologists at Lancaster hold a ‘Volcano-Ice’ day, which brings together volcanologists who study all aspects of volcano and ice interaction. I remember most of it was centered around Icelandic volcanism but I cannot complain. I mainly went along to it to see what research was going on and it was a day to escape coursework. I enjoyed it. Now for the Volcano and Magmatic Studies Group (VMSG) conference it was not only fun, informative, socialable but I think it was character-building for me too. One thing, I had never been to Norwich before so that was an experience to try and find the hotel I was staying at, another was stepping outside my comfort zone and having over 200 people under one roof. I am an odd person, I find being surrounded by large numbers of people uncomfortable. But I managed. Oral and poster presentations (including my own poster) captured a whole spectrum of research. Geology, geochemistry, petrology, geophysics, serious games…that is not even all of it, it was such a rich diversity. But that is what volcanology is. You have researchers that study volcanoes and use different ways to study them. Basically, one volcano is viewed and interpreted in so many different ways. My poster on risk perceptions was a little different (it was mainly based on socio-psychological concepts) but I never felt my work was undervalued or treated differently. Quite the opposite in fact. Volcanologists who had expertise outside my area of interest were reading my poster, asking questions and generally seemed to appreciate how I approached my research. It was interesting to observe the social dynamics of the conference. People who knew each other really well tended to congregate together. People by university also clustered together. But at the same time, there was mingling (slipping in some magma science there!). It did find it slightly overwhelming that the larger volcano research universities greatly outmatched the tiny number of volcanologists at my university (1 academic, me and 4 students) but I suppose that does not matter, it is what makes us different as a little volcano research group (if you could even call it that?). It reminded me of Collectormania (or any other kind of Comic Con). Full of people passionate about volcanoes (comics) but have preferences to sub-disciplines (different comic companies and characters). Minus the cosplay and fangirling. Okay that was perhaps a silly comparison. 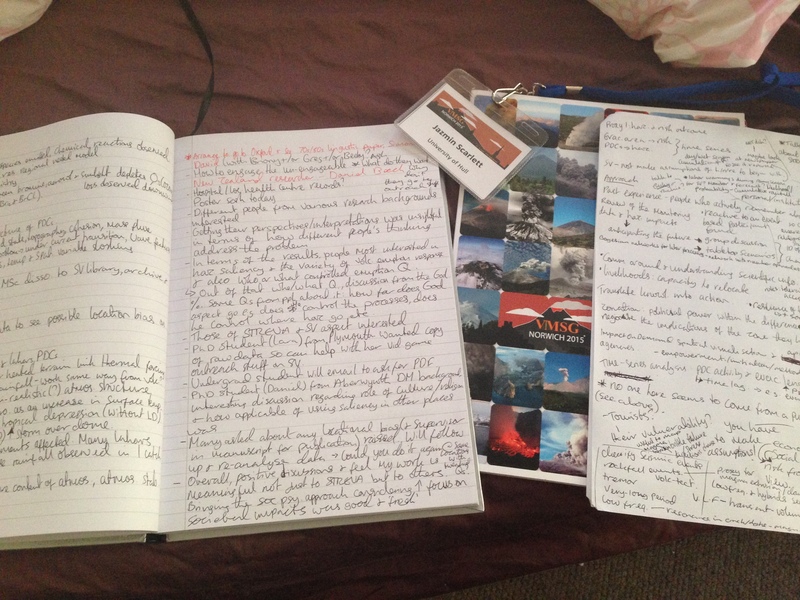 There was also a workshop on volcanic risk so being interested in it, I went along. There was a smaller number of people and there was certainly great discussions happening around the various topics covered in the workshop. I really enjoyed that and I even added to the discussions. Everyone had different experiences to share and exchange. I will remember for a long time the experience of a woman who was involved in responding to the Mt. St. Helens eruption in the 80s. As an early-career researcher I found it so valuable to hear the experiences of those who are well established in this vast discipline. I just hope that one day I contribute just as much. I am looking forward to the next VMSG in Dublin…it is another place I have not been to!